Our December meeting is this Wednesday December 9, 2015 at 7pm. Everyone is welcome! We will meet at the East District Family Resource Center, 2405 Jefferson Ave.
On the agenda: - City Traffic Engineer Michael Sawyer to discuss UH traffic issues - New Year's Police Appreciation Project with Ann Wortham & Nancy Lampert - Rescheduling UH Progressive Dessert/Holiday Celebration to January - Nikia Lemaire's term as President is ending December 31. Marc Anderson has agreed to serve as acting President, unless there is an interested person to assume the role. Monthly meeting is Wed Nov 4 @ 7pm. Get to know your neighbors at the monthly UHCA meeting on Wednesday November 4 @ 7pm. This month, we will meet at the Tricycle Gardens Hqtrs, 2314 Jefferson Ave. Agenda items include plans for the annual Holiday Progressive party, neighborhood clean ups, food and clothing drives, and more. Please join us and bring a friend. The meeting is open to all. Monthly Meeting: Wednesday October 7, 2015. When: Wednesday, October 7, 2015, 7:00 pm. Join your neighbors for lively discussion regarding all things Union Hill! -Virginia House of Delegates Representative Jennifer McClellan. She'll give us an update on legislative issues concerning the Commonwealth and the 71st House District. -Better Housing Coallition's rehabilitation and new construction at 2230 Venable Street. Lynn McAteer will review plans for the renovation and improvement of the property known as "The Citadel of Hope". -2100 block of E. Leigh Street. Should it become one-way heading west? Bill Conkle is seeking neighborhood input. -Progressive Dessert 2015. Selection of a date and general logistics. Please bring your thoughts, ideas, and a neighbor. Join us for a great meeting! Neighbors' meeting Wed Sept 2 @ 7pm, TricGdn Hqtrs. Please join your neighbors Wednesday September 2nd at 7pm for an hour of discussion and presentations. Meeting at 2314 Jefferson Avenue, Tricycle Garden headquarters. Agenda includes a presentation about new construction proposed for 2325 Venable Street. Developer is seeking a Special Use Permit beyond the R63 zoning for Union Hill. Socialize afterwards with a drink, snack or dinner at the Union Market. See you there! Friends of Jefferson Park and Union Hill Civic Association--everyone welcome! Join your neighbors Tuesday, August 11th at 7pm, for a combined meeting with the Friends of Jefferson Park and the Union Hill Civic Association. Matt and Alicia Conrad have graciously invited us to gather at their home, 2002 Princess Anne Avenue. 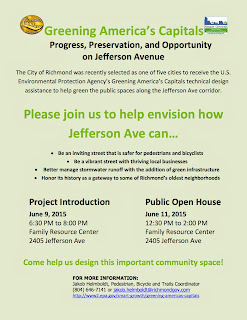 The City of Richmond was recently selected as one of five cities to receive the U.S. Environmental Protection Agency’s Greening America’s Capitals technical design assistance to help green the public spaces along the Jefferson Ave corridor. -honor its history as a gateway to some of Richmond’s oldest neighborhoods. Family Resource Center Family Resource Center, 2405 Jefferson Avenue. Come help us design this important community space! Our May meeting is this Wednesday, May 13 at 7pm at the Union Market! Hello Neighbors! We will be holding our May UHCA gathering @ the Union Market. This will be a very relaxed and social gathering to welcome the coming summer. TOPIC: Development at 1903 E. Marshall Street The developers of 1903 East Marshall will meet with UHCA, Friends of Jefferson Park, and the Church Hill Association to discuss their application with the City of Richmond Board of Zoning Appeals for special exceptions to the current zoning regulations for the property. The developer would like to initiate discussion with neighbors on the specifics of their request for clarification purposes. Please join us in Jefferson Park to learn more about the project and how it will impact our neighborhood. Aprill 22 meeting is a potluck social! Spring brings to mind thoughts of renewal and new growth, fresh air and fun times. Let's spring into action by coming together to make Union Hill a beautiful and fun place to be this Spring. We will be holding our next UHCA meeting on Wednesday, March 25th at 7pm. This month in honor of Spring, our meeting will be held at the Tricycle Gardens office on Jefferson Ave.
At 7:45pm, we will head over to Union Market for our UHCA Social. Please join us for our informational meeting & Social and help us swing into Spring. Take pride in our community and help beautify Union Hill. Volunteers are needed to help pick up debris from Jefferson Park and the streets and sidewalks of Union Hill. Pickers, gloves, and bags will be provided. The group will meet at the Jefferson Park park house at 8:45 AM. Bring a friend, or a team of friends! For questions, call 804-322-3016 or email fojp.rva@gmail.com. Come one, come all to the February UHCA Meeting! Bring your neighbors and friends, and get the scoop on all the cool projects and interesting happenings in Union Hill. Since our January meeting was postponed, our February agenda will packed with tons of info. We will certainly have some great conversation points to discuss during the UHCA Social Hour, so come and join us! The monthly meeting scheduled for Wednesday, Jan 28, 2015, will be postponed due to the MPACT/7th District meeting being scheduled at the same time. The new date, time, and location is TBD, and we will advise the membership accordingly once that info is decided.